In August 2007 Sevilla paid PSV Eindhoven a reported €12 million for their Ivorian striker, Arouna Koné. Club president, José María del Nido, commented at the time that Koné was “One of the best attackers in the world” and that his acquisition gave them the strongest side in their history. Sevilla had just won two successive UEFA Cups and the signing of Koné on a five-year contract was the icing on the cake. Koné had come to Europe as a 19-year-old, playing for Lierse SK in the Belgian first division. Despite his youth and lack of experience Kone scored 11 goals in 32 games in his year at Lierse. He then moved to Roda JC of Kerkrade, a town in the old coal mining area in the south of Holland. He regularly scored goals, like this spectacular one, for the club which usually finished in the top half of the Eredivisie table. In his two years at Roda he scored 27 goals in 63 appearances. Koné clearly impressed reigning champions PSV when he scored this beauty against them for Roda, so it was no surprise when he joined the Eindhoven side in the summer of 2005. He was to spend two years at PSV, winning the Eredivisie title twice and scoring 21 goals in 52 matches. Given Arouna Koné’s previous track record in Holland, the move to Sevilla promised so much for him and the club. However, the first season did not go to plan. He had been signed only a few days after Sevilla midfielder, Antonio Puerta, had suffered a heart attack on the field of play and died three days later. A couple of months after that their successful coach, Juande Ramos, left for Tottenham. It was a difficult period for the club and Koné. The striking partnership of Frederic Kanoute and Luis Fabiano was to become very successful and Koné’s altercation with a member of the club’s training staff made national television. His difficulties were compounded when he suffered cruciate knee ligament injury in August 2008, when playing for Ivory Coast against Guinea, leaving him out of action for six months. On 1 February 2010 Koné joined Hannover 96 on loan, scoring on his Bundesliga debut, at Hoffenheim. He had only appeared once for Sevilla in the 2010-2011 season, that being as a substitute in the last minute. His career was to be revived when he was loaned to Levante UD for the 2011-2012 season. Levante had come up from the second division the previous year, gaining 14th position in La Liga. Koné’s arrival was to spark an upturn of fortune for the poorer relations in the city of Valencia. His first goal for them was a winner against Real Madrid in September 2011. Levante were to finish 6th and qualify for the Europa League, with Koné scoring 15 goals in 34 appearances, including one against Sevilla. He missed the last three games of the season , having suffered an injury. Moreover, if he had reached 18 goals the terms of his contract meant that he would have to return to Sevilla. Koné played one game for Ivory Coast in the recent African Nations Cup tournament, on the right wing against Algeria. He has tough competition for a striking position for his country, being up against Didier Drogba and Salomon Kalou. However, he has already represented his country 38 times, scoring 9 goals. Koné also played Champions League football at PSV. The Ivorian comes from a humble background, being the eighth of fifteen children that his father had through three wives. He is a man who stays in contact with his roots, supporting his large extended family back in Ivory Coast. Together with Ali Al Habsi they are practicing muslims and both will be found praying at the appropriate times. His elder brother Bakari is a 31 year old winger currently playing in Qatar, following seven years in France playing for Lorient, Nice and Marseille. Bakari has played 41 games for Ivory Coast, scoring 9 goals. When Koné joined Wigan Athletic in summer he took over the number 2 shirt, as he had done at Levante. He likes to dye his hair yellow, as did his basketball hero, Dennis Rodman. With 10 goals in the league under his belt, Koné is getting close to reaching Henri Camara’s record of 14 goals in a season for Latics. He has also made 5 assists. His transition to English football has been rapid. An excellent target man, able to withstand strong physical challenges, he is yet to incur a single yellow card this season. He is fast, intelligent and a team player. 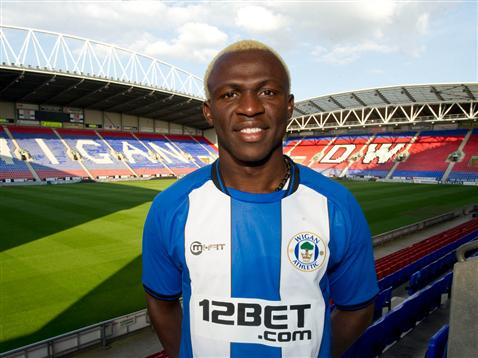 The move to Wigan has been a good one for Arouna Koné. The disappointment of his time at Sevilla is now water under the bridge. He has all the attributes to be a top class Premier League centre forward. Although he has done very well so far one feels that the best is yet to come from the 29-year-old Ivorian.